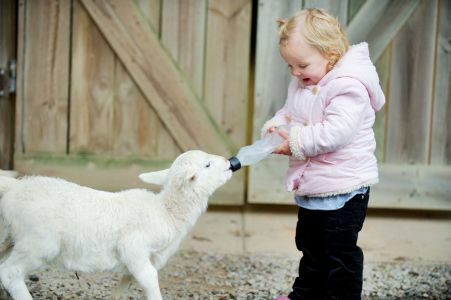 The Hahndorf Farm Barn is a family owned children's farmyard animal nursery and wildlife park where everyone gets to experience life on the farm! You can enjoy an interactive experience and hop into the pens with our friendly animals. You can try your hand at milking a cow, bottle feed the baby lambs, goats and calves and feed the kangaroos, wallabies, emus, deer, miniature horses, Shetland ponies, ducks and peacocks in our wildlife park. Meet Billie the alpaca and his friends. Check out our new owls, kookaburras and our other feathered friends along with heaps more native wildlife and reptiles. Visitors can bring a picnic or enjoy a BBQ in our undercover picnic area and enjoy a fantastic family day out! Coffee and refreshments available. Baby change facilities available. NEW - Pony rides now available between 11.30am and 2.30pm on weekends, public and school holidays. Farm shows @11am and 2.30pm every day and Wildlife & Reptile show @12.30pm on weekends, public and school holidays. Approximately 2.2 km from the centre of Hahndorf, heading toward Mt Barker.